Our pre lit Christmas wreaths really rock. These live wreaths are fresh from the forest and our elves add lots of sparkles. They start with beautiful evergreens which they weave into a circle. Then, they add ornaments and colorful jingle bells that really ring each time you open your door. Next the Christmas Forest elves add LED lights to complete these eye-catching outdoor Christmas wreaths. Finally, Santa's helpers pack the luxurious red bow in the box in its own bag to preserve freshness. So, you have beautiful fresh Christmas wreaths with greens and golds and reds. You also have the interesting textures of noble fir, pine, metal bells and ornaments. Those are all complemented by the softness of the red velvet Christmas bow. The pre lit outdoor Christmas wreaths have battery operated LED lights, colorful jingle bells and shiny ornaments piled as high as a snow drift. As much a favorite as the song for which it is named, this wreath delights both young and old alike with all the sights, sounds, and scents of the season. We include the batteries. Order 10 or more wreaths for a 10% discount. 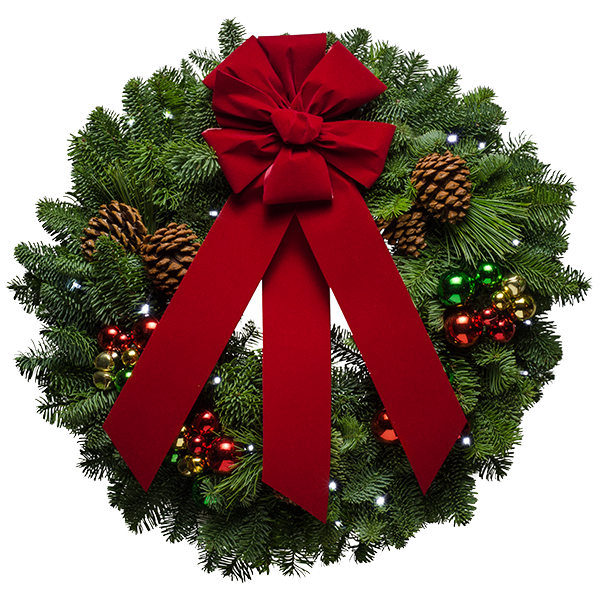 "I just wanted to tell you that our Jingle Bells wreath arrived and it is BEAUTIFUL! It is so fresh and smells like it was just freshly cut." Loaded with ornaments and bells!